Westerly yachts, built in England, have long been admired for high standards of craftsmanship, exceptional strength, and sea kindly offshore performance. The Westerly Ocean 49 was one of the first offshore designs to embrace a wide beam carried farther aft towards the stern, now common among modern yacht designs. 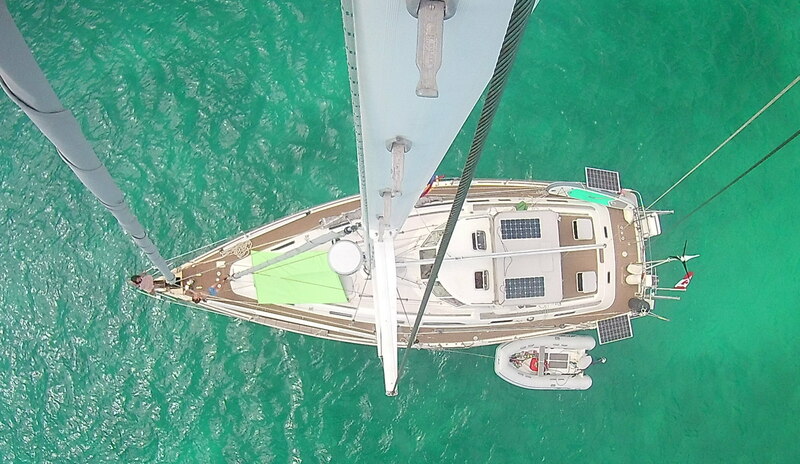 The wide aft section provides reduced heel upwind, great downwind performance, and a huge aft cabin. Laridae was built in 1995 and launched in 1996. Under her first owners’ experienced watch, she completed a circumnavigation between 1996 and 2012, receiving extensive refits in 2007 and 2011. Her major systems (sails, rigging, electronics, batteries, charging systems, etc) were refit again in 2015-2016 in the UK before she crossed the Atlantic to the Caribbean. She continues to be cruised in the Caribbean and maintained well. All systems are working well and she is ready for a new owner to step aboard and enjoy her in the Caribbean, or sail her on new adventures; perhaps back across the Atlantic to the UK/Europe/Med, or through the Panama Canal and across the Pacific Ocean. The top 10 reasons why the Westerly 49 is a great cruising boat! The wide transom provides a huge aft cabin so living aboard doesn’t feel like camping. The large Corian countertop and deep sink make cooking and cleaning up for a crowd more enjoyable. The high-performance hull makes sailing faster and more comfortable than a 45’ catamaran. All of the sails are controlled from the safety of the cockpit and furling them is a breeze. The solar panels and wind generator keep the batteries fully charged, so no need to burn diesel. The dining table is solid and large enough to fit all of the family and friends. The lovely warm teak interior stays cool on sunny, hot days. The deep keel, large rudder, and powerful bow thruster make handling in tight quarters easier. The modern, dependable systems mean that you spend more time enjoying life and less time fixing stuff. The solid Westerly craftsmanship is trusted and secure!